Thanks to everyone who helped out with the extensive alpha and beta releases with all the bug reports, crash log submissions, and feedback. It has all been a huge help in creating the best Paint.NET release ever. Preferred: Use the built-in updater from within Paint.NET. If you are using version v3.36, simply go to the Help menu and click on “Check for Updates.” For v3.5 alpha/beta, go to the Utilities menu instead of the Help menu. Or, just wait for the update prompt to come up automatically within the next week or so. 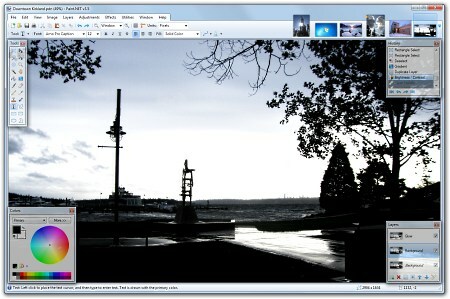 Download directly from the website: http://www.getpaint.net/ . There is no need to uninstall the old version; that will be taken care of automatically. On Windows 7, the Text tool will use DirectWrite (instead of GDI) which gives better performance and greatly improved quality. On Windows Vista, you may install the Platform Update for Windows Vista to enable this feature; otherwise GDI will be used. Added a “Manage Fonts” command to the Utilities menu. This will launch the built-in Windows font control panel. The DirectDraw Surface (.DDS) file type now allows you to select the resampling algorithm for auto-generated mip-maps. Is there any way to reach you besides using this post system? I’m currently doing a scholarly essay on why teachers pick open source over paid, closed-source and vice versa. Paint.net is a neat alternative as it’s free, but closed source. I’m looking for information about schools that use Paint.net. I look forward to your reply. Hooray! The betas sure kept us waiting for the final build, but it was totally worth it! Great job, Mr. R. Brewster! Thank you for this great release! Another one of my favorite programs to start using Aero glass, and I’m still stuck with XP… oh well. I was wondering, how do you make use of SSE from within C#? Do you have custom .NET assemblies written in C++/assembly? 3.5 version is simply amazing! The new look is great. How the hell did you managed to create Paint.NET looking so wonderfull ? Can you waive confidentiality hem ? Is there an explanation for how Surface Blur works somewhere? Jose, Maybe you noticed the “Contact” section of the website … ? But, I don’t have any information that would be of use for you. I haven’t talked with schools about how they use or don’t use Paint.NET. George Slavov, SSE is used by the C++ / “Native” DLL. It helps a *lot* with Squish, a library used for *.DDS handling. The other libraries in the native DLL benefit as well, such as GPC. Anders Elfgren, I’m sure you can do a web search for it. It’s been in other photo applications too. Thanks for a wonderful job. Love the way it now starts like – boof! No reason to associate any other app with the formats I open most. Congrats Rick for this awesome release! I love how you implimented Aero, especially around the menu bar, in this release. Thank you very much for your hard work! It works really well and it looks awesome in Windows 7. Where are all the features? I don’t get it, this program used to work much like photoshop now it doesn’t! I’m still not sure how one gets to be as awesome as you guys are, but I hope to learn one day. Thanks and lots of love for an awesome piece of programming. Try setting UseCompatibleTextRendering to true for the buttons. Pingback: Paint Net 3.5 lançado! If you install it at home, you can copy the installation files to a USB key and run it from work. I got this auto-update, and it’s awesome. However, I have one problem- it won’t accept my tablet pressure any more. Even the brush tool is the same size, like in GIMP. Is there any way to fix this, or to get the old one back? Congratulations for another amazing work. Bell, tablet pressure support was removed. If you search for “tablet pressure removed” (or similar) on http://searchpaint.net you’ll find many posts on the forum about it, along with an explanation why. Kudos on the fantastic release! I guess I understand why you had to take pressure sensitivity out, but it has always worked for me. Is there anywhere I can re-download a previous version that still includes that feature? This post is for José NOV 7, 2009. I have installed paint.net in my school(primary school). I have 11 computers in the computer lab and I have been using it for the last three years. I have also installed several plugins effects and the kids love to experiment with them. Rick, thank you for all the work you have put in this project, I am not a programmer just an end user. Great work! I know that Paint.NET was originally intended to be a replacement for MS Paint. Why didn’t that work out? I think MS should’ve licensed out Paint.NET for Win 7..
Krishna, Paint.NET was never intended to be a replacement for mspaint. I have been using program for over 2 years. It was great program before and even better now. What I like most is how it remains easy to use for simple projects but has the power to do complex jobs. I’ve gotta chime in about the tablet pressure too. Couldn’t you have made it opt-in if it was causing problems for some people, so we could keep the feature? I’m sorry, but this renders it almost useless for my artwork. 😦 I have to go reinstall 3.36 now so I can keep working. Aurrin, unfortunately having it as an option would have *increased* the complexity of the code. It would not have improved the situation. Please be patient though. Hopefully it’ll make a comeback. I really like the startup time being greatly improved. Also it works like a charm on W7! Great program! Bruce, nope. Nor do I have any plans to.